Do yourself a favor and try our Pastitsio (Greek-Style Lasagna). 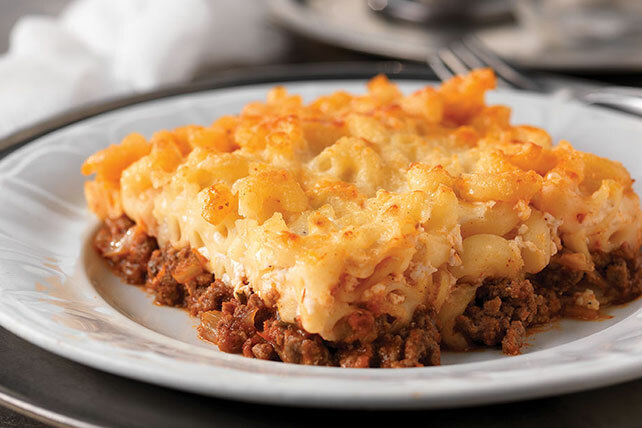 With a sprinkle of nutmeg, pastitsio is as easy to make as it is delicious. Brown meat with onions in large skillet; drain. Stir in pasta sauce and vinegar; simmer on low heat 15 min., stirring occasionally. Heat oven to 350ºF. Spread meat sauce onto bottom of 13x9-inch baking dish sprayed with cooking spray; top with macaroni mixture and cheese.